Follow an energy-efficient, durable and environmentally friendly home as it comes to life in a picturesque beach community. And learn what it takes to build a LEED® certified home. Sunset Green Home has earned LEED® Platinum certification! There's something for everyone in our sustainability blog. Progress Updates on Sunset Green Home's construction. Monthly Practical Sustainability column featuring small actions you can take to save money and preserve the environment. House Tours of green homes we have visited. Get to Know LEED articles, which explain the LEED for Homes green building program. And more! We work with commercial, institutional and residential clients to improve the energy and environmental performance of their building projects. We advise on material and technology selections that promote healthy indoor air quality, occupant comfort and building performance. Sunset Green Home is the story of the rebirth of a home that was made uninhabitable by Hurricane Sandy. It's the story of how a state, county and town enacted property tax incentives to encourage homeowners to build energy efficient and sustainable homes. 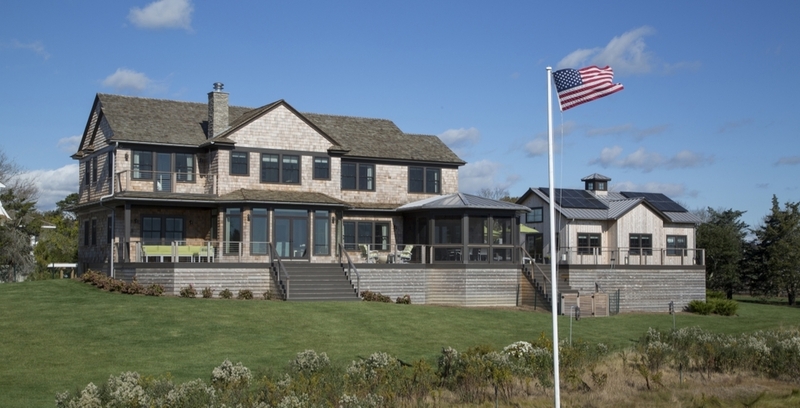 Read what others have written about this LEED Platinum certified home. A lot goes into the construction of a durable, energy efficient, sustainable - and beautiful - home. Check out our Resource Guide, which features many of the products and companies involved in the project. Part I presents our sponsors and Part II presents a room-by-room guide to the products and technologies used in the home.